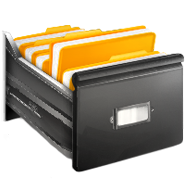 Does your organization have file cabinets taking up half of your office? You wouldn't keep all those files unless they were important. QuestingHound Technology Partners has a solution to handle your company's information. We offer a comprehensive document management solution as a repository to help you streamline your business and improve the speed of productivity. The experienced technicians at QuestingHound Technology Partners know the same solution doesn't work for everyone. To get the best file dispersal available,our technicians will work hand-in-hand with you to tailor a solution that will meet your organizational needs. Utilizing QuestingHound Technology Partners' Document Management expertise boosts productivity. For more information about how a properly managed Document Management System can benefit your organization, or if you would like to talk to someone about other of QuestingHound Technology Partners' IT services, call us today at 954-727-2200.